Okay. I’m not dead. But my car is. On Sunday, my girlfriend and I were driving down a four-lane highway (2 lanes for each direction of traffic, natch) toward my sister’s college graduation. As we were passing a tractor trailer (fully in view of his mirrors), he flipped on his turn signal. He immediately and quickly began to merge into our lane. I slammed on the brakes, but it wasn’t enough. 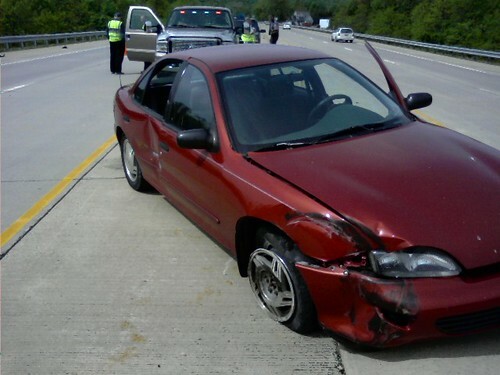 My poor car was slammed by the semi in two places–the front of the hood and the rear passenger door. We were sent careening across a raised median and into the two lanes of oncoming traffic. The truck driver did not stop. 1) We were in a tiny, 1-mile stretch without any walls dividing the highway. Had we run into a median wall, we would have been killed. 2) The two impact points directly sandwiched my girlfriend. If the truck had hit where she was sitting it would probably have been the end of ol’ Rachel. 3) We somehow, miraculously managed to miss all oncoming traffic. 4) Despite coming within feet of it, we avoided the guard rail on the opposite side of the highway. 5) When the car eventually screeched to a stop, we were sitting atop the median, completely out of harm’s way. I feel incredibly lucky to be here today blogging obnoxiously. Soon I will be the owner of a brand new car (I’m looking into the Prius at the moment). At the moment, money is going to be tight and a lot of the more extravagant recipes and foods I have bookmarked to try may not happen as fast as I had planned. Thank god for $21 worth of free artisan chocolate! On a related note, when I had to kick the car door open, I felt like an action hero.